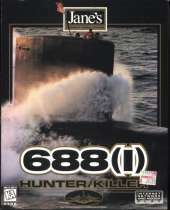 The most realistic submarine simulation ever developed for PC. Master the sonar and weapons control systems, learn to develop real target situations and outfit your boat with the latest advanced weaponry. Then use your skills to complete the tour of duty and earn your dolphins to become a true submariner. A truly authentic simulation: Developed by Sonalysts, a defense contractor who designs submarine simulators for the US Navy. Over 12 detailed operating stations: Control all aspects of submarine warfare, including the sonar suite, fire control, helm and target motion analysis. Real-World Terrain: Ocean depth and water density for the entire globe are based on actual satellite topographical data. Real-life situations: Conduct detailed training and single missions, plus a full campaign based on political analysis from real world situations. Multiplayer Warfare: Seek and Destroy up to 8 players over the internet or LAN. Full 3D Technology: Full 3D technology allows for multiple camera views and accurate 3D models of over 20 different naval weapons platforms. Complete Control: Manage all of the resources of your submarine, including crewmen training and weapons load-outs.